Healthy Now and Later: Are You A "Healthy Ager"? A new study finds that exercise among older adults helps ward off depression, dementia and other health problems, such as heart disease, cancer and diabetes. The researchers found that exercise increased the odds of healthy aging as much as sevenfold. Even better news, it's never too late to start: Even adults who begin exercising later in life could increase their odds of healthy aging threefold. The report was published online Nov. 25, 2013 in the British Journal of Sports Medicine. "In a growing elderly population, it is important to encourage healthy aging. Physical activity is effective in maintaining health in old age," said lead researcher Mark Hamer, from the department of epidemiology and public health at University College London, in England. "Encouraging physical activity in older adults is of benefit, and small changes are also linked to healthier aging." Samantha Heller, a senior clinical nutritionist and exercise physiologist at NYU Langone Medical Center in New York City, said it's no secret that physical activity and exercise are good for us. "What this study emphasizes is that the 'I'm too old' excuse doesn't fly, because it is never too late to get your fanny off the couch and out the door for some exercise," she said. The benefits of exercise include improved bone, muscle, cardiovascular and organ health. Even better circulation and brain benefits like an increase in communication between neurons. 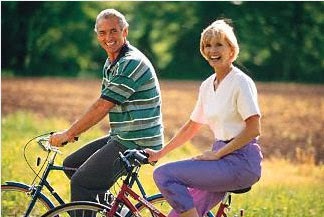 In fact Heller confirmed that exercise may slow the brain tissue loss associated with aging and mental decline. "The question we face now is, How do we motivate and support people of all ages to get moving and keep moving? There is an undeniable resistance among non-exercisers to the notion of motion," Heller said. "On an individual level, we can gently insist that family and friends join us in regular walks, a dance or yoga class, a game of tag, or an exercise DVD." Partnering with someone is a real motivator or even investing money so the money isn't "lost" if the membership or equipment goes untouched. For the study, Hamer and his colleagues collected data on nearly 3,500 people with an average age of 64 who participated in the English Longitudinal Study of Aging. The researchers kept track of their exercise, along with serious health problems, such as heart disease, stroke, diabetes, emphysema and Alzheimer's disease. They also monitored the participants' mental health and physical strength. Over eight years, almost one in 10 participants became active and 70 percent remained active. The others stayed inactive or became inactive. By the end of the study, almost 40% of the participants developed a chronic medical condition, almost 20% were depressed and one-third had a disability. 1 in 5, however, was considered by the researchers to be a "healthy ager," an obvious association being between healthy aging and exercise. The researchers found that people who partook in moderate or vigorous physical activity at least once a week were 3-4 times more likely to be healthy agers, compared with those who remained inactive. People who were active at the start of the study were 7 times more likely to be healthy agers than people who were inactive and remained so. The CDC recommends 2 hours and 30 minutes of moderately intense exercise a week, or 1 hour and 15 minutes of vigorously intense exercise, along with two or more days of muscle strength training. If you're not already, this may be a great New Years Resolution (*hint* hint*).